Memorial Choeten (stupa) is located at the center of Thimphu city. It was built in 1974 by Her Majesty the queen mother Phuntsho Choden Wangchuck in the memory of her son, Third king of Bhutan, Jigme Dorji Wangchuck. This stupa today has become a spiritual nerve center of Thimphu city. One will witness people from all walks of life circumambulating and prostrating around this stupa. 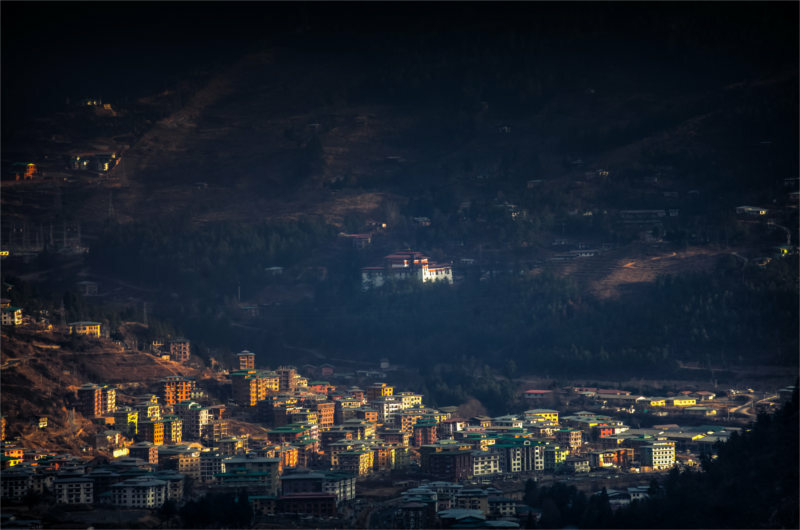 Elderly people who have come from far away villages to stay with their children and those who reside within Thimphu make their way early in the morning and spend their whole day chanting prayers and circumambulating the stupa. 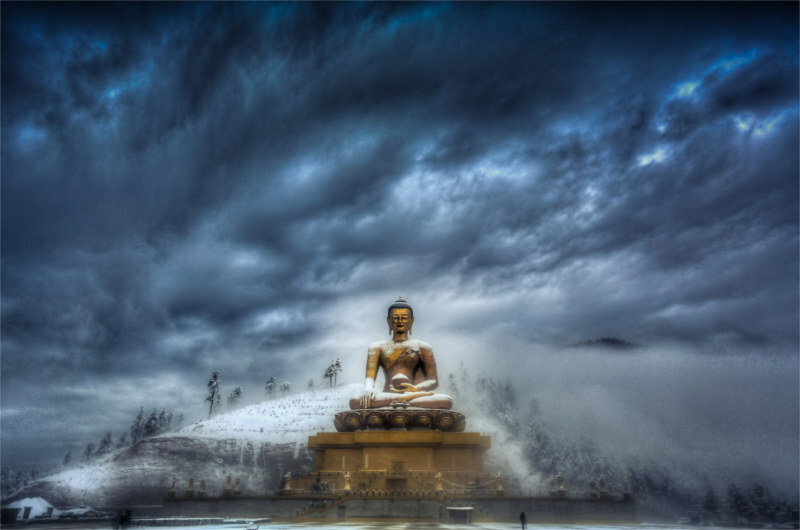 Located at Kuenselphodrang, facing Thimphu valley down bellow is the worlds’ largest and tallest Buddha statue standing at the height of 169 feet (51.511 m). The statue houses one hundred thousand of smaller Buddha statues, the exact replica of the outer Buddha statue. From here one can have a 360 degree view of Thimphu valley. 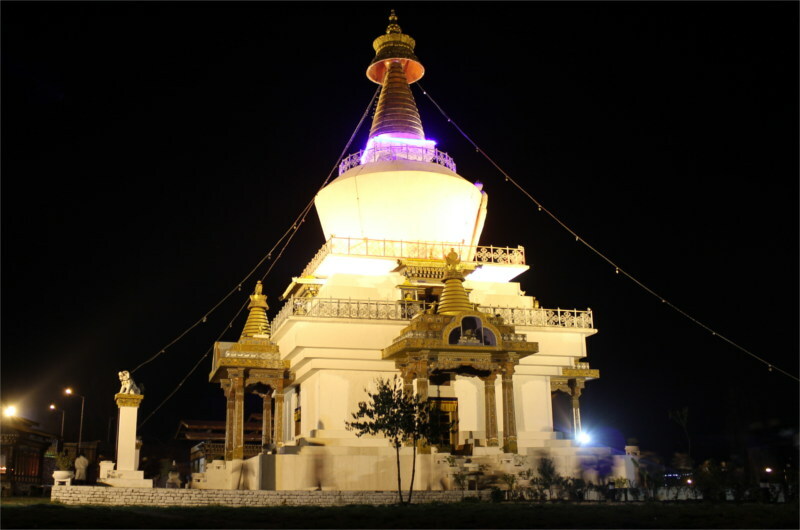 The project to construct statue begun in 2006 and was completed in 2015 at the cost of $100 million with the help of thousands of sponsors both from Bhutan and outside. Below the statue is kuenselphodrang Nature Park with an area of over 900 acres. Thimphu Tashicho Dzong is located on the bank of the Wangchu River in Hejo village under Thimphu district (capital). 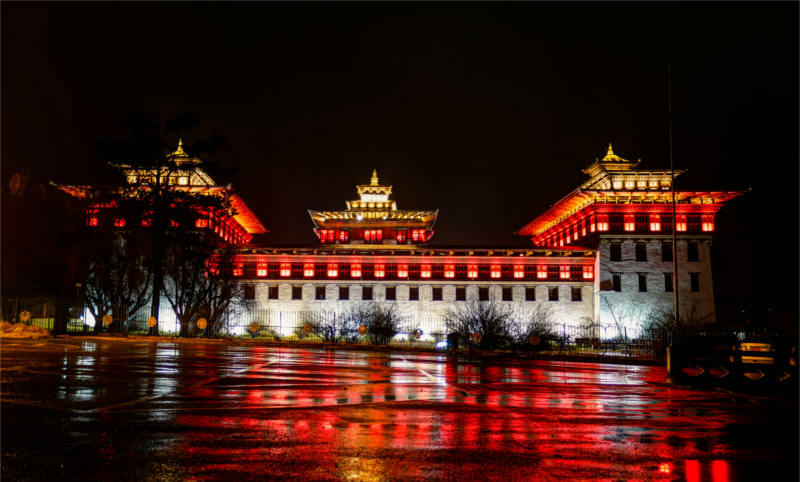 It was built in 1641 by Zhabdrung Ngawang Namgyal and enlarged in 1694 by Gyalse Tenzin Rabgay the fourth secular ruler of Bhutan, who ruled from 1680 to 1694. The dzong was entirely rebuilt under the command of Third King Jigme Dorji Wangchuck in the year 1962. Today, the dzong serves as the seat of the central government, His Majesty the King’s office, and the summer residence of Je Khenpo (Chief of Abbot) and the Central Monastic Body. Located around 5 km south of Thimphu town, Simtokha Dzong is the oldest Dzong in Bhutan built by Zhabdrung Ngawang Namgyal in 1629, it is believed to have been built over a stone onto which Zhabdrung Rinpoche pinned down a demon and subdued it. The Dzong contains the bed chambers of Zhabdrung and Desi Jigme Namgyal, the father of the first King of Bhutan. Formally known as Sanga Zabdon Phodrang (Palace of the Profound Meaning of Secret Mantras), the Dzong contains many sacred relics. Tango monastery is located at north of Thimphu, approximately 14 km drive from Thimphu city and 40 minutes’ hike from the road point. 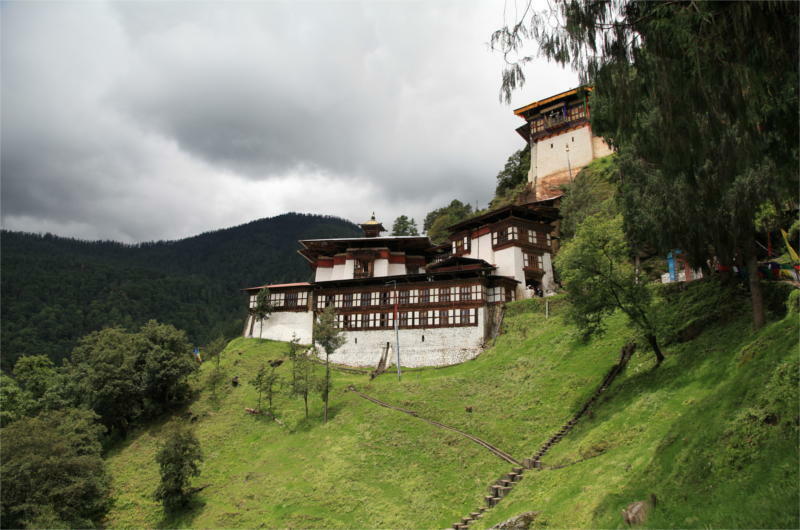 The monastery’s name honors Phajo Drugom Zhigpo’s (Buddhist priest) meeting with the horse-headed deity Tandin (Hayagriva) who prophesied that Phajo would help the teachings of Drukpa Kagyu flourish in Bhutan. The monastery today houses the College of Buddhist Studies. Many tourist visits to this monastery as part of their hiking trip in Thimphu. Located 23 km east of Thimphu city, Dochula pass at the height of 3100 m above sea level is Bhutan’s most decorated and beautiful pass. 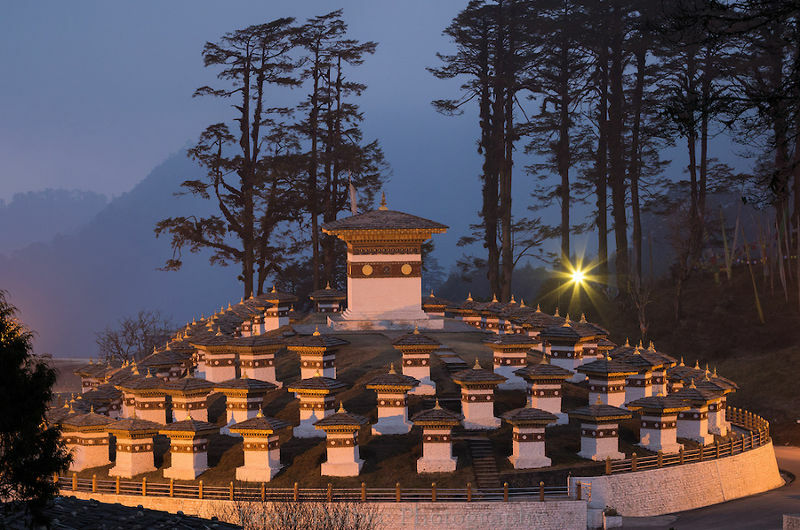 On this pass is 108 stupas called Druk Wangyal Chortens, built by Queen mother Ashi Dorji Wangmo Wangchuck. There is also a temple called Druk Wangyal Lhakhang built in the honor of fourth king of Bhutan, Jigme Singye Wangchuck for his service to his subjects. The front yard of this temple is a venue for Druk Wangyal festival which is conducted annually in the month of December. On the backdrop of this pass is the stunning view of snow capped mountain ranges and amongst which is Bhutan’s tallest mountain Mt. Gangkar Puensum(7570m).